Curve studied by Fuss in 1788, Steiner in 1827, Chasles in 1831. 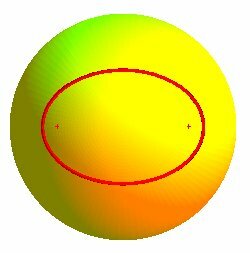 Spherical coordinates of the foci F, F': (the third coordinate is the colatitude), hence . 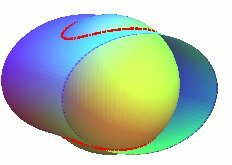 Bipolar equation of the spherical ellipse on the sphere with radius R: (geodesic distance). Bipolar equation of the spherical hyperbola: where G is the symmetric image of F with respect to xOy. 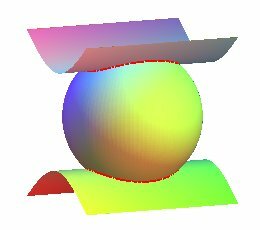 The spherical ellipse is the locus of the points on a sphere for which the sum of the distances (taken on the sphere) to two fixed points F and F' on the sphere is a constant. 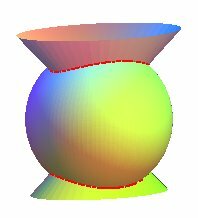 In other words, it is the result of the classic gardener's method for the planar ellipse, transposed for the sphere. 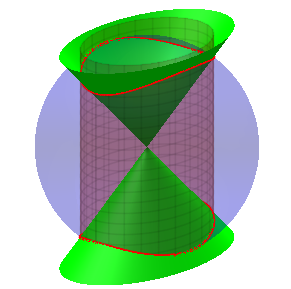 With the above notations, the locus of the points satisfying is composed of the previous ellipse and its symmetric image with respect to xOy; the reunion of the two ellipses can therefore be referred to as "spherical hyperbola". 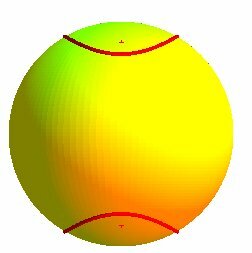 Using the formulas of spherical trigonometry, one can prove that the spherical hyperbola is the intersection between the sphere and an elliptic cylinder passing through the center of the sphere. 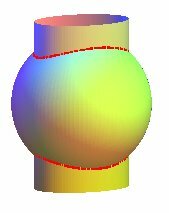 It is therefore an algebraic curve of degree 4, intersection of all the quadrics of the beam generated by the sphere and the cylinder (remarkable examples are represented above).